Religion is central to the lives of many Latin Americans. Indeed, majorities in most countries surveyed say religion is very important to them. Two-thirds or more express this view in Honduras, Guatemala, Nicaragua, El Salvador, the Dominican Republic, Colombia, Ecuador, Puerto Rico, Costa Rica, Peru, Brazil, Bolivia and Venezuela. In the United States, by comparison, 56% of the general public and 60% of Hispanics say religion is very important in their lives. 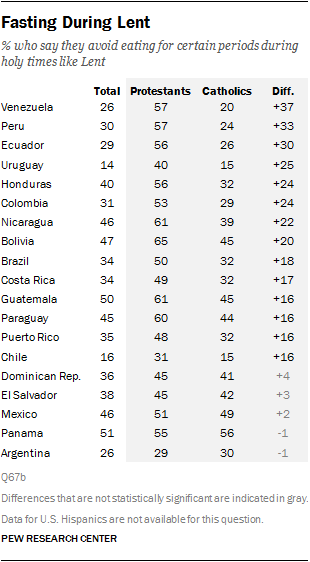 In general, Protestants in Latin America are more likely than Catholics to say religion is central to their lives. Protestants also tend to be more observant when it comes to attendance at religious services and daily prayer. Differences between Protestants and Catholics extend to their involvement in congregational life, including participating in church councils, leading small groups or ministries and teaching Sunday school. Across Latin America, Protestants consistently exhibit higher levels of engagement in these areas than do Catholics. Majorities in most countries surveyed say that religion is very important in their lives. 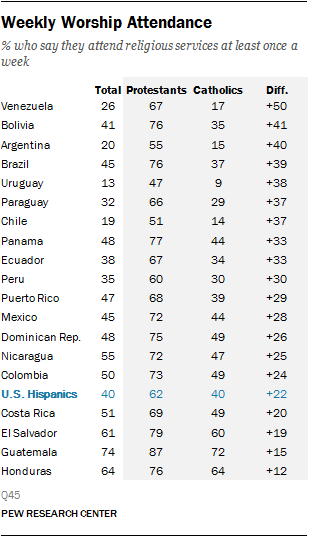 The exceptions are Mexico (44%), Argentina (43%), Chile (41%) and Uruguay (28%). In general, Protestants are much more likely than Catholics to say that religion is very important in their lives. This is especially true in Chile, where 73% of Protestants say that religion is very important to them, compared with 40% of Catholics. On this question, large gaps also exist between Protestants and Catholics in Uruguay (29 percentage points), Argentina (25 points) and Peru (20 points). This pattern holds true among Hispanics in the U.S. as well. Three-quarters of Hispanic Protestants (78%) say that religion is very important to them, compared with 65% of Hispanic Catholics. In many Latin American countries, older Catholics are more likely than younger Catholics to describe religion as central to their lives. 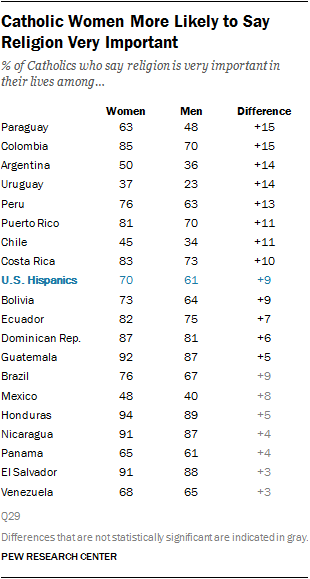 Generational differences are particularly wide in Chile, Mexico, Uruguay, Argentina, Paraguay and Costa Rica. In Mexico, for instance, about half of Catholics ages 35 and older say religion is very important in their lives, compared with 31% of those ages 18-34. Gender differences also are evident among Catholics in many countries, with women more likely than men to say that religion is highly important in their lives. The largest gender gaps on this question appear in Paraguay, Colombia, Argentina and Uruguay, where the shares of women who say religion is very important to them are 14-15 percentage points higher than the comparable shares of men. 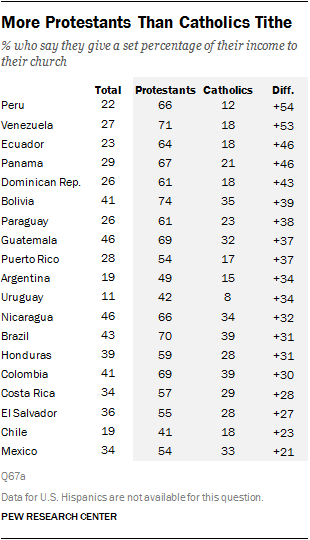 Among Protestants in Latin America, the importance of religion does not vary significantly by age or gender. 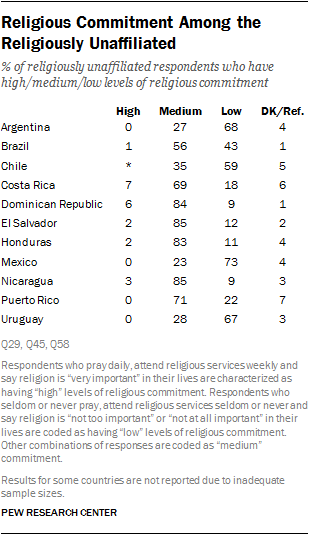 The frequency with which Latin Americans attend religious services varies across the region. In most Central American countries, roughly half or more say that they participate in worship services at least once a week. By contrast, one-in-five or fewer respondents in Argentina (20%), Chile (19%) and Uruguay (13%) report attending religious services as often. In the United States, four-in-ten Hispanics say they attend church at least once a week. In each of the countries surveyed, Protestants are considerably more likely than Catholics to attend religious services weekly. In Venezuela, for example, Protestants are about four times as likely as Catholics to attend church at least once a week (67% vs. 17%). In Bolivia, Argentina and Brazil, gaps of roughly 40 percentage points exist between the shares of Protestants and Catholics who go to services weekly. Among both Catholics and Protestants, those ages 35 and older are more likely than younger adults to report attending religious services weekly. In most countries, Catholic women are more likely than Catholic men to attend services weekly. Among Protestants, women and men are about equally likely to attend religious services in a majority of countries where adequate sample sizes are available. But in five countries – Costa Rica, Guatemala, Honduras, Panama and Nicaragua – more Protestant women than men say they attend church at least once a week. Across Latin America, prayer is a regular feature of day-to-day life. Majorities in most countries surveyed report praying at least once a day, including three-quarters or more in Guatemala (82%), Paraguay (82%), Honduras (78%), Costa Rica (78%), El Salvador (77%) and Nicaragua (75%). Prayer also is central to the lives of most U.S. Hispanics: About six-in-ten (59%) report praying once a day or more. In nearly every Latin American country surveyed, Protestants are significantly more likely than Catholics to say they pray at least once a day. Some of the largest gaps are found in Argentina (where 69% of Protestants and 38% of Catholics say they pray daily), Peru (75% vs. 46%) and Uruguay (62% vs. 33%). In some countries where sample sizes are large enough to permit analysis, substantial minorities of people with no religious affiliation say they pray every day, including at least four-in-ten in Honduras (47%), Costa Rica (46%), the Dominican Republic (46%) and Guatemala (44%). 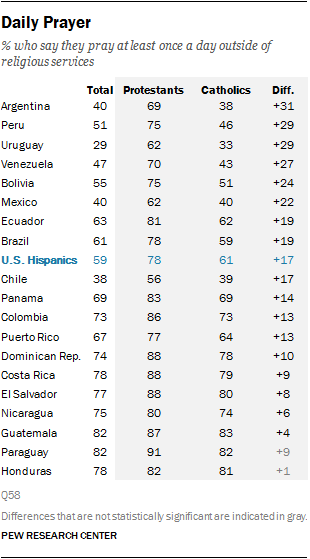 Daily prayer is much less common among the unaffiliated in Mexico (8%), Uruguay (7%) and Argentina (6%). Similar to attendance at religious services, daily prayer is more frequent among Latin Americans ages 35 and older than it is among young adults. This pattern holds true among both Catholics and Protestants. Across Latin America, women are significantly more likely than men to pray daily. Among Catholics, this pattern holds true in nearly every country surveyed. In most countries polled, Protestant women and men are about equally likely to pray daily. But in a few places, including the Dominican Republic, Nicaragua and Puerto Rico, more Protestant women than men say they pray at least once a day. These three standard measures of religious commitment – importance of religion, attendance at religious services and frequency of prayer — can be combined into an index to summarize overall levels of religious commitment among Latin Americans. Respondents who say that religion is very important in their lives and also report praying daily and attending religious services weekly are characterized as exhibiting a “high” level of religious commitment. Respondents who say religion is not central to their lives, and who also say they seldom or never attend religious services and seldom or never pray, are categorized as demonstrating “low” religious commitment. Other combinations of responses are put in the “medium” commitment category. In most countries surveyed, majorities have medium levels of religious commitment. 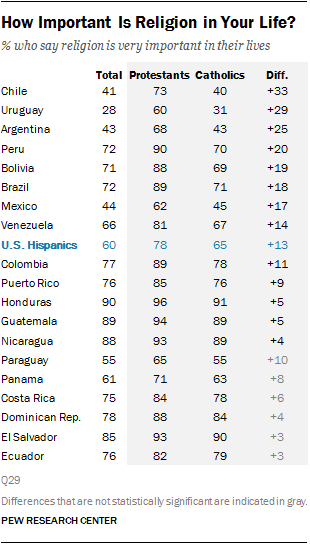 At least seven-in-ten adults occupy this middle category in several countries, including Venezuela (77%), Paraguay (77%) and Mexico (73%). 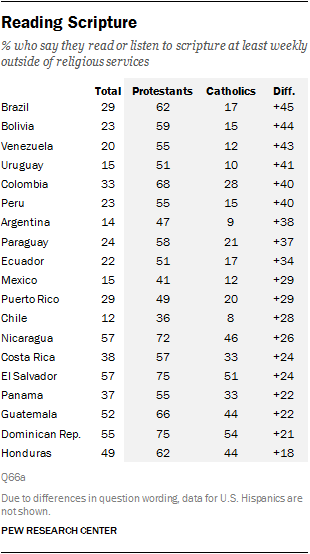 High levels of religious commitment are most common in Central America, where half or more of the respondents qualify as highly observant in Guatemala (62%), Honduras (53%) and El Salvador (51%). By contrast, relatively few Argentinians (13%), Chileans (13%) and Uruguayans (10%) display high religious commitment. Nearly two-thirds of U.S. Hispanics (63%) exhibit medium levels of religious commitment, while 28% have high levels of commitment, and 7% are in the “low” category. Few, if any, religiously unaffiliated respondents report high levels of religious commitment. But substantial proportions of this group – ranging from 23% in Mexico to 85% in El Salvador and Nicaragua — show medium levels of religious commitment. In Uruguay, Latin America’s most secular country, 28% of the religiously unaffiliated fall into the middle category, while none have high levels of religious commitment and about two-thirds (67%) report low commitment. In most countries, fewer than a third of respondents who attend church at least occasionally also report serving on church councils, leading small groups or ministries or teaching Sunday school. Involvement in congregational life is most common among churchgoers in some Central American countries, including Guatemala (34%), Honduras (32%), Nicaragua (30%), Panama (27%) and El Salvador (27%). In every country surveyed, Protestants report higher levels of involvement in congregational life than do Catholics. In Guatemala and Honduras, for example, more than four-in-ten Protestants say they are involved in church activities outside of worship services, compared with roughly one-quarter of Catholics. The survey also asked respondents how often they personally read or listen to scripture outside of religious services and how often they participate in scripture study groups or prayer groups. Across the region, Protestants are considerably more likely than Catholics to say they engage in each of these activities. Among people who are not affiliated with any religion, relatively few say they participate monthly in scripture study groups. And in most countries where adequate sample sizes are available, few among the religiously unaffiliated say they read scripture weekly. But in Nicaragua and the Dominican Republic, roughly three-in-ten or more say they personally engage in weekly scripture reading. The survey asked all respondents about tithing – that is, giving a percentage of their income to their church or congregation. Overall, fewer than half in most countries say that they tithe, including only about one-in-ten Uruguayans (11%) and one-in-five adults in Argentina (19%) and Chile (19%). But more than four-in-ten respondents in Nicaragua (46%), Guatemala (46%) and Brazil (43%) say that they give a percentage of their income to the church. Protestants are far more likely than Catholics to say that they tithe. In fact, in each of the countries surveyed, the share of Protestants who report tithing is more than 20 percentage points higher than the comparable share of Catholics. The biggest gaps are seen in Peru, where 66% of Protestants and 12% of Catholics tithe, and in Venezuela (71% vs. 18%). Few among the religiously unaffiliated say they tithe, including just 1% in Chile and Uruguay and 2% in Argentina and Puerto Rico. In a majority of countries surveyed, at least a quarter of respondents report fasting during sacred periods, such as Lent. Fasting is generally more common among Protestants than among Catholics, although in a few countries, including Mexico, Panama and Argentina, Catholics and Protestants are about equally likely to fast. Why has Pentecostalism grown so dramatically in Latin America?